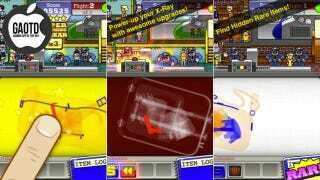 This is actually a clever idea for a smartphone game: you watch people's baggage and try to spot weapons. See? Clever! But Airport Scanner is much more than that. In Airport Scanner, there are a variety of things you must keep an eye out for—from pistols and dynamite to ice skates and large bottles of water. Baggage scrolls through the x-ray machine, and once you notice the illicit goods, you touch them on the screen. It all makes for easy and fun smartphone gameplay. You earn in-game cash (which you can also buy with real world money) to upgrade your x-ray machine and purchase new airports. While I played, I just used the virtual money I earned in the game—that seemed to suffice. Though, I do imagine there's a glass ceiling like with many of these games. So unless you are willing to invest large amounts of time into playing, you might find yourself shelling out real money. Airport Scanner isn't just about finding bad baggage (though, the game has that in spades). You must also go through everybody's luggage in a timely fashion so they don't miss their flight. Here, though, it seems like almost every other passenger has a weapon of some kind. The time management element seems vaguely realistic. And it's honestly something I'd never thought about and probably just took for granted: All those TSA agents must go through all that luggage and check everything, but still need to get everyone to their flights on time. You even need to make sure you fast track the crew so they get on the flight first. It's these little details and gameplay elements that help make Airport Scanner a surprisingly deep experience.